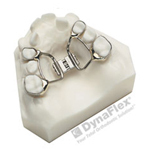 The palatal expander "expands" (or widens) your upper jaw by putting gentle pressure on your upper molars each time an adjustment is made. This can help widen the upper jaw to give you a fuller smile and create more space. Dr. Shojaei prefers this method over pulling permanent teeth and routinely uses this appliance to help create space to align all your teeth.